Another famous dish from Indonesia. We usually go to the special restaurant to eat this dish, this is authentic taste, and i got the recipe from from my friend Ami . We need some effort to make this delicious food, im glad that My hubby like it too!. Heat oil in a large, heavy-base saucepan, heat oil, add garlic cook for 1 minute. Add chicken until cooked trough, add mushroom, black fungus, soy sauce, kecap manis, olyster sauce, cook for further 4 minutes, season with salt and pepper. Boil water in a large pot, add garlic and chicken thighs, cook for 15 mins,season with salt and pepper. Add shallot, set aside. 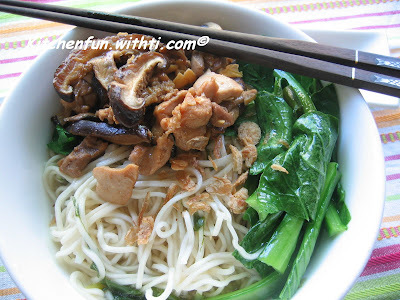 Place noodle in a large serving bowl. Top with chicken mushroom, fried wonton, blanched pak choy and fried onion, serve with Chicken stock and sambal oelek or chili sauce. Season with salt and pepper. susyehh amat bikin ... nih sebelah kantor gw ada bakmi GM ti .. mau gak gw kirimin??? gambarnya maksdud gww ... wekekekee ..
wah ntar gw coba bikin bakmi gm. gw juga merantau. sering bangent mimpi makan bakmi gm. untung ada pegemar berat sekelas dgn gw!